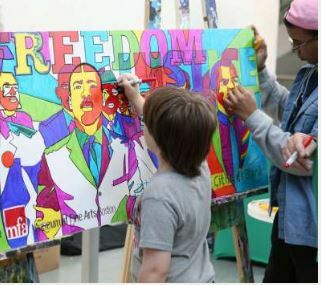 There’s an array of vibrant, engaging, and collaborative programs scheduled throughout the day for all ages and abilities, presented in the spirit of Dr. King. Citizens Bank has sponsored the MFA’s MLK Day Open House for 17 consecutive years—allowing the Museum to welcome more than 120,000 visitors into our galleries for free to enjoy performances, tours, talks, art making, and more! Musical acts taking place throughout the day include a performance by Boston City Singers, a nonprofit organization that provides comprehensive music instruction to over 500 youth in the inner-city annually. Concerts by Castle of Our Skins will celebrate creativity and culture through music in pieces featuring string quartets by celebrated African-American composers. Additionally, youth string quartets from Project STEP (String Training Education Program) will perform classical compositions in the MFA’s Shapiro Family Courtyard. Project STEP’s mission addresses the imbalance of racial and ethnic minorities represented in classical music by providing musically talented children with comprehensive music and string instrument instruction through mentoring and performance opportunities. An annual tradition, the Community Arts Initiative Partner Spotlight—on view in the Shapiro Family Courtyard—will present artworks created by students from the 10 community organizations that partner with the MFA, including five Boys & Girls Clubs of Boston located in Blue Hill, Charlestown, Chelsea, Roxbury and South Boston; Boys and Girls Club of Dorchester; West End House Boys & Girls Club of Allston-Brighton; United South End Settlement House (USES); Boston Chinatown Neighborhood Center (BCNC); and Vine Street Community Center. Gallery tours throughout the Art of the Americas Wing will be led by Museum-trained guides and available in English, Spanish and American Sign Language (ASL). Additionally, 15-minute Spotlight Talks will highlight John, 1st Baron Byron (2013) by Kehinde Wiley, Iago’s Mirror (2009) by Fred Wilson, a secretary desk (1841) by Thomas Day and a storage jar (1857) by Dave the Potter. Also on view during the Open House are the exhibitions Graciela Iturbide’s Mexico and Cecilia Vicuña: Disappeared Quipu, which feature interpretation in English and Spanish. Additionally, visitors can see the exhibitions Ansel Adams in Our Time, Boston Made: Arts and Crafts Jewelry and Metalwork, Jack Bush: Radiant Abstraction, The Art of Influence: Propaganda Postcards from the Era of World Wars, Candice Breitz: Love Story, Exhibition Lab: Sargent and Fashion and Collecting Stories: Native American Art.